Nike's "Breaking-2" attempt in Italy this weekend might not produce a sub-two hour marathon, but it will probably lead to a world best time, three exercise physiology experts have told Reuters. Assuming conditions are conducive to fast running - cool and not too windy - all three predict a time inside Dennis Kimetto's 2014 world record of two hours, two minutes, 57 seconds when Kenyan Olympic champion Eliud Kipchoge, Ethiopia's Lelisa Desisa and Eritrea's Zersenay Tadese take to the Monza motor racing track, aided by a group of "in and out" pacemakers. But shaving three minutes off the world record, albeit in a run that would not stand due to the in-out pacemakers, is a tall order, no matter what the conditions. It would mean bringing down Kimetto’s average pace of four minutes, 41 seconds per mile, to 4:34, or the equivalent of nearly two seconds for every 400 metres. An improvement of seven seconds per mile might not sound much to an average weekend jogger, but it is an extraordinary challenge for elite runners already at the limit. "This is physiologically possible, the athletes attempting it, the pacing scheme, the shoes and the course should all make a difference," Michael Joyner, an expert in human performance at the Mayo Clinic, told Reuters. "However, a 2.5 percent jump in a distance running record is very big by historical standards and the weather is the wild card." Joyner thinks there is a roughly 50 percent chance one of the runners will better 2:01:30. "That time would represent a great accomplishment and really reset the whole conversation," said Joyner, who wrote a paper back in 1991 predicting that a sub two-hour marathon was feasible. The world record at the time was 2:06:50. Another expert, Mike Hahn, predicts a winning time of roughly 2:00:30. "It is physiologically possible (for someone to break two hours). It’s a little harder to pin down exactly when it will happen," said the director of the Bowerman Sports Science Clinic at the University of Oregon. Apart from the usual marathon variables, Hahn is curious as to whether the new Nike Zoom Vaporfly Elite shoes the runners will wear will provide extra assistance. "One of the major ways to improve running economy is to get more propulsion out of the footwear," he said, before observing that the apparently super lightweight shoes "potentially could be the least comfortable running shoes ever". Another factor will be how well the pacemakers do their job - both in hitting various distances at pre-planned times, and in shielding Kipchoge and company from any headwinds on the loop course. Erring on the side of caution would be wise for them, said Evan Day, a PhD student at the University of Oregon and an expert on running economy and foot mechanics. 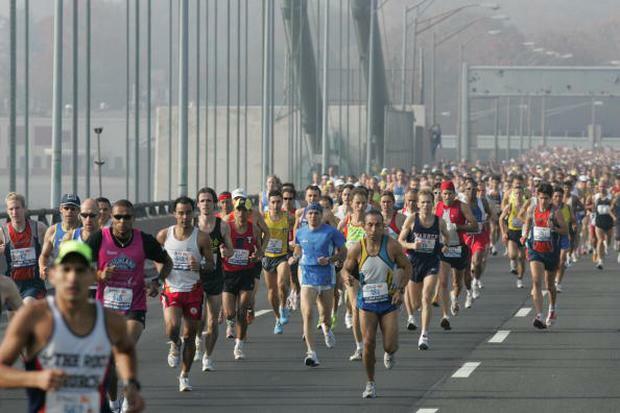 Day observed that most major marathons ask the pacemakers to pass halfway in just over 61 minutes. He suggested the Monza pack aim for a few seconds under one hour. Any quicker, he said, and there is a big risk of losing huge chunks of time late in the race. Day is going out on a limb in predicting the two-hour barrier will fall, probably to Kipchoge, a former 5,000 metres world champion who has sizzling track speed to back up his endurance. "The world record is a definite, it's just a matter of by how much," Day said, before making his prediction for the weekend - 1:59:59.